Paula joined Zonta on 9th July 1977. 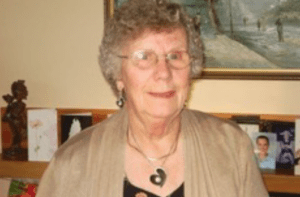 She was born in Manchester, England in 1933 and emigrated to New Zealand with her husband and children, settling in Blenheim and worked as a Public Health Nurse. She was elected President for 1986 – 1987 year and in that year she formed the Marlborough Z Club which had senior students from both the Marlborough Boys and Marlborough Girls Colleges. It was a very active and successful Z Club which operated for a number of years and which lead to Paula being appointed to the Zonta International Z Club Committee. She became an international judge for the Emma Conlon awards. In 1988-1990 biennium she served as Area 8 Director when District 16 included Australia. She serviced all the clubs in the South Island and the lower North Island up to Napier. In 1989 District 16 separated from Australia (which became District 23) and Paula stood against Joan Mary Longcroft for District Lieutenant Governor – but was defeated by one vote. Paula was invited to be a member of the Zonta International Century Club in February, 1990 and became one of this selected group of 100 Zontians from clubs all around the world. Also in 1990 she was chairman of Time Keepers at the Zonta International Convention in Dallas, Texas and the same role at Convention in Hong Kong 1992. For organising a book project with Bohally Intermediate School, Paula received the Zonta International PR award. The Club’s Zontians wrote letters to Zonta Clubs around the world requesting a book to be sent from their locality for the intermediate school’s library thus fostering international understanding. Zonta Club of Marlborough Area established Attendance Certificates and Paula achieved full attendance every year for eleven consecutive years. She was a very committed Zontian and followed her Mother’s maxim, if it’s worth doing, do it well – and then some! She thought the classification of members gave a variety of women across careers and interests that she may otherwise have not met. As with Toastmasters she enjoyed being in a world wide organisation and she appreciated the three levels, club, district and international. In her Area Director role she chaired four full weekend workshops and met some amazing people in both Australia and New Zealand who have remained friends over the years. Billeting is a special Zonta way of getting to know other Zontians at more than a superficial level which made it a very rewarding twenty-one year’s experience. Paula’s husband John was very proud of her achievements in Zonta.